The Bible is filled with stories of people who were directly guided by God. Noah was guided to build an ark. Moses was guided to lead God’s people. Mary and Joseph were guided to travel to Egypt to escape King Herod. But how does God guide us today? How do we know what He wants us to do? Is it possible to miss His guidance and mess up His plans? In Following God’s Guidance, you will explore the different ways God communicates to you and how you can learn to recognize His direction. You will see how He speaks to you through the Bible, through circumstances, and through a “quiet nudging” within your Spirit. Above all, you will discover how to discover God’s presence and direction in a fresh way. The Women of Faith® Bible Studies provide intriguing insights into topics that are relevant to women’s lives today. 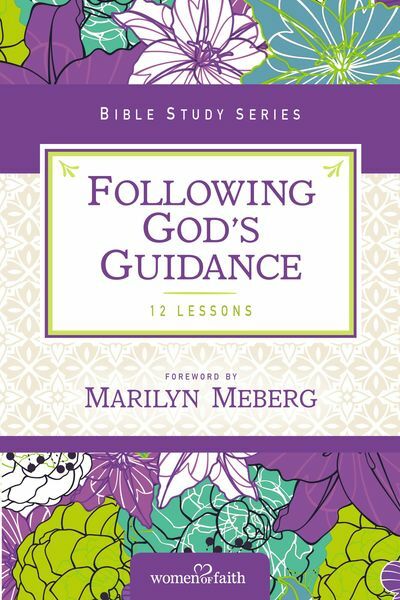 Each guide includes twelve weeks of study, down-to-earth illustrations, and reflections to help you move the truth from your head to your heart. A leader’s guide for use with small groups is also included.